Space Clearing is a technique used to clear, balance and/or eliminate discordant, predecessor, old and stagnant energies from the environment. Physical places can get saturated with dense, heavy, unworkable energies and they can become stored and the cause of imbalanced energy fields which warp and affect our ways of being when we are in them. Space Clearing is a way of cleansing and disconnecting physical places from energies which adversely affect those who live and work in them. Space Clearing & Protecting can dramatically improve the energies and feel of a place, making it a more pleasant environment and fostering more harmonious living and working conditions. Today we live in a complicated, stressful world where the consciousness of inner and world peace is being overpowered by fear, war and discord. Regularly clearing these energies and intentionally balancing the energy in your home can create harmony for you and your family. Many different tools can be used for a space clearing; bells, drums, sage, clapping, salt, tuning forks and essential oils are just a few that can be used during any clearing or balancing ceremony. Space Clearing consists of cleansing, purifying, blessing, and protecting the home and land to bring your space into peace, balance and harmony. DesertStar Healing utilizes the Practice of Smudging to Protect & Bless the Space after it is Cleared. Smudging is the practice of spiritual cleansing, protection, blessing, and involves burning of certain dried herbs. The burning of herbs and resins for purification or blessings has been used in many cultures around the world. Smudging is the Native American way of using the power of herbs for cleansing, protecting and blessing. It is a very simple yet effective method of clearing a place, an object or a human being of negative energies. 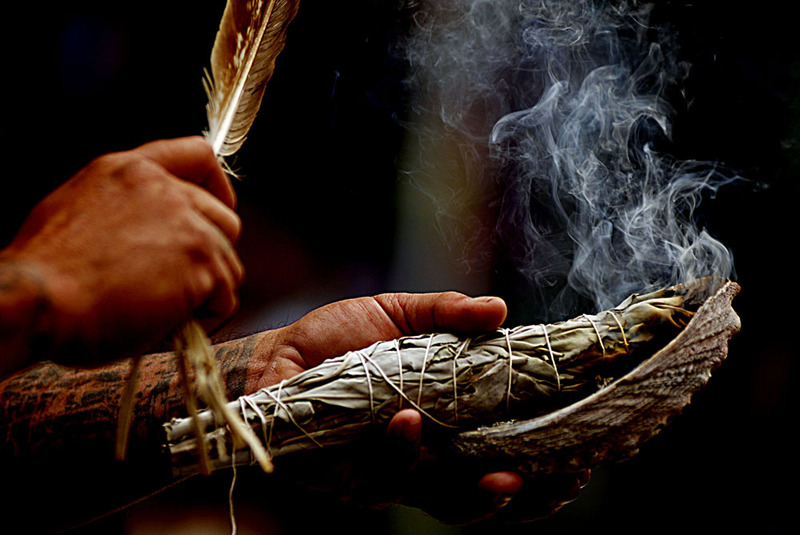 The most common plant used for smudging is sage, specifically white sage. Dried sage stems and leaves are bundled together and bound tightly into what is known as a smudge stick. When lit up the smudge stick produces a very cleansing and pleasant smelling smoke. However, entities and negative astral beings dislike the scent of white sage and flee from it. Smudge is therefore perfect to purify and clear people, places and ritual tools from negativity. The act of smudging is a sacred ritual. DesertStar Healing uses forms of journeying to spirit worlds, along with prayer and ceremony to communicate with the spirit world; guardian angels, nature spirits, and evolved spiritual teachers for healing, guidance and wisdom. Most indigenous cultures practice some sort of space clearing rituals on a regular basis. In South America, Asia and India, Shamans perform space clearing rituals for health, family prosperity and abundant harvests. There are so many positive benefits experienced from regular space clearing and energy balancing. First and foremost you will feel light, joyful and at peace. Depending upon your intention, doing a ceremony to energetically imprint that intention can be a powerful way to manifest your desires. When preparing for a new relationship or baby. To clear predecessor energies left over from previous occupants of your home. Aid in healing from an illness and to ward off colds. Cedar– Cedar tree is a sacred tree believed to have healing properties. Cedar smudge sticks are used in healing and for ceremonial purposes. The cleansing effect of cedar is not quite as intense as that of white sage, but cedar smoke brings in a friendly, healing energy, and is a good alternative for those who have an aversion to sage. Lavender– Lavender has powers of protection and cleansing. It has traditionally been used in herbal medicine for many infectious diseases and has a soothing effect on the nervous system. Magically it is used for protection and also for love. Lavender brings a positive energy, opens the heart chakra and calms the mind. Sweet Grass– Sweet Grass is a traditional Native American herb that is also sometimes burned for smudging. However, sweet grass holds an energy of blessing rather than cleansing and is used after smudging with sage, to bring in positive energy after negativity has been released, rather than on its own. Tips for Energetic Cleansing & Revitalization – on your own!